Auslly (Aus/tin and A/lly), is the romantic/friendship pairing of Austin Moon and Ally Dawson. They are great friends and care a lot about each other. Ally was the first to admit her feelings for Austin in GirlFriends and Girl Friends. Austin realized that he has feelings for Ally . They were a couple for a little while, but decided to be friends for now because their relationship was getting in the way of their partnership in Couples and Careers.However, they agreed to get back together when they both think they're ready to be a couple again. Ally admitted that she still has feelings for Austin in Fresh Stars and Farewells and at the end of the episode Austin almost admitted that he loves her but he gave her a card instead. It is highly possible that they will get back together in Season three. ​Austin and Ally first met in Rockers & Writers and they started off on the wrong foot when Austin accidentally steals Ally's song, "Double Take" when he heard her playing it at Sonic Boom in the practice room. Throughout the episode, Ally is very upset with Austin. Austin later then apologizes and said that he wanted to prove his dad wrong about his love for music and that it's not a waste of time, which Ally's dad, Lester Dawson, also said to her. Ally says she would write him one more song. At the end of the episode, Austin asks Ally to be his partner. Ally doesn't think it's a good idea at first but then agrees and their musical journey begins. As time progressed, they start to get even closer. Ally finally revealed her feelings for Austin in Girlfriends & Girl Friends after she helped him plan a perfect date for him and Kira. Unfortunately, he and Kira start dating at the end of the episode, leaving Ally upset. In Campers & Complications, Ally's old camp friendElliot came to the town to visit her, which resulted that Austin started to be jealous because of their friendship, even though he was dating Kira. After talking to Dez he realized he has a crush on her. At the end of episode he and Elliot had a battle and Kira found out he was caring so much, because he has feelings for Ally and breaks up with him. After the battle, Ally and Trish found out Austin has a crush on Ally. In Chapters & Choices they still needed to hide their feelings for each other. Austin couldn't decide who he wants to be with. He first chose Kira, but she told him that she needs time to think about it. But after he sang "You Can Come to Me" with Ally on her mom's party, he finally realized that she is the one who he wants to be with. He kissed Ally after the performance, but then Kira arrived and agreed to be Austin's girlfriend and hugged him, leaving Ally heartbroken. In Partners & Parachutes Austin breaks up with Kira to be with Ally. He told Ally that he wants to be with her, but she still thought he was hesitant. After Austin serenaded Ally, she forgave him and they officially became a couple. Their relationship ended in Couples & Careers because they feared their relationship was getting in the way of their songwriting, but agreed to stay friends and partners, always. In Tunes & Trials, Austin wrote a love song about Ally, and Austin admitted he still had feelings for Ally, but quickly denied it by saying he loved being friends with her. In Real Life & Reel Life Dez and Trish make a movie about Austin and Ally. Unfortunately, it's revealed that Ally wanted to end their partnership and Austin met with another songwriter when Ally conquered her stage fright, which resulted a big fight between them. Dez and Trish came up with idea that they need to remake a scene from Chapters & Choices when they performed "You Can Come to Me". After their performance, they kissed and Dez was filming them, but when he said 'cut' they didn't want to stop. After the kiss they apologized to each other. When Trish asked them why they didn't want to stop kissing, they started to act awkward and said it was just acting, but it was heard, that they lied. In Fresh Starts & Farewells, Ally admits she still likes Austin and thinks he still has feelings for her, too. At the end of the episode Austin almost said he loves her by almost saying 'I love you', but he gave her a card saying "Thinking of You" instead. When Ally said Austin had to do something for her, he replied, " Anything. Name It. " The cutest couple in the world! Auslly!! <3Austin feels bad for stealing Ally's song and wants to make it up to her. When Austin tries to make Ally more fun by setting up strobe lights, he grabs her hand and spins her towards him, and for a moment, Ally was pressed against him. When Austin and Ally are working on writing Break Down The Walls, they share a moment when they're playing the piano together, and their hands touch and they look at each other, blush, and smile. When Ally's nervous to play the piano for Austin while he performs on The Helen Show, Austin tells her she'll do great and winks at her. Austin tries to help Ally overcome her stage fright. When trying to convince Ally to become his partner, Austin says they're a perfect match. Austin and Ally almost hug each other twice. When Austin and Ally almost hugged twice, Austin was the one who wanted to hug Ally first and Ally wanted to give him a handshake. After they almost hug twice, Austin put his hand on Ally's back. Austin, Trish, and Dez tried to fun Ally up. When Trish and Dez told Ally she needed to hurry up and write a song for Austin before people forgot him, Austin defended her and told them to cut her some slack. Austin promised Ally he would watch the store while Ally was helping Trish, but he got engaged in some other activities. Ally doesn't want to hurt Austin's feelings by telling him that the people aren't really coming to see him. Austin told Ally he was sorry for rushing her to write a new song. Austin and Ally smile at each other while Austin's performing. During his performance, Austin pointed and winked at Ally, and she smiled back and gave him a thumbs up. Austin says he'll always be an Ally Dawson fan. Ally replies with a smile and says "Awwww!" Austin becomes interested in Ally's book after Dez mentions her crushing on someone.Auslly hug! Ally crushes on a guy with very similar characteristics to Austin. When he thought Ally had a crush on him, Austin tried to let Ally down easy, meaning he cared about her feelings. When Austin found her book she gives him a hug and said "I love you, I love you, I love you!". As the two are playing the piano to write a new song, Ally keeps scooting closer to Austin. After Austin found out the truth, Ally timidly asked him why he freaked out so much when he thought she liked him and asked if she was that horrible, and Austin tells her that she had it all wrong because he thinks she's awesome, but he didn't want to ruin their friendship, and Ally agreed also, meaning if they didn't have such a close friendship they would consider dating. Austin went to Ally for a hug. Austin sings a song representing his and Ally's relationship. Austin didn't want to tell Ally that he didn't like her song because he didn't want to hurt her feelings. "You broke my crayon!!" Both Austin and Ally want to get to know each other better. Austin went to Fright Night as the swamp guy, and Ally went as the swamp bride. When Dez and Trish were bonding, Austin told Ally he wished they were like that. After Walter accused Ally of honking at him, Austin took the blame so she wouldn't get in trouble. Austin and Ally both said they had a good time. When Ally was showing Austin their new song, they share a moment on the piano. During the song It's Me, It's You, Austin put his arm around Ally. Austin grabbed Ally's hand that was holding a crayon and scribbled all over her coloring book to get her to color outside the lines. Austin brought up his awesome music skills to Ally when he and Dez were cooking, possibly trying to impress her. The first song that Ally wrote had a lot of sweet things about Austin in it, she said that it captures everything he's about, as if thats how she looks at him, and she might have been picturing him with all that stuff in her mind. Austin told Ally he loved the song at first because he didn't want to hurt her feelings. Austin couldn't believe that Ally didn't know about his personality very well. Ally was super excited for Austin to perform the song she had written about him on the live webcast. Ally was upset that Austin didn't like the song. Ally was upset that Austin didn't tell her that he didn't like her song. Austin wanted Ally to get to know him better. The pond that Ally took Austin to was kind of romatic. Austin was excited when Ally was stealing Pickles. Ally agreed with Austin when he thought Pickles attacking the movie theater guy was funny. When Austin was singing the new song he was pointing at Ally and singing to her. Ally wanted to show Austin that she actually colored outside the lines. Austin gave Ally a basket of pickles. Austin and Ally in Bloggers and Butterflies. *Ally tried to comfort Austin by telling him that H8ter Girl's websitewasn't very popular. Ally was willing to face her fear to save Austin's career. Austin tried helping Ally with facing her fear. Ally thought it was sweet that Austin cared about her stage fright and told him he would be the first person she would talk to about her stage fright when she was ready to. Before Ally went up to perform, Austin tried to get her to relax by telling her she was going to do great. Austin didn't want to see Ally suffer, so he sang The Butterfly Songfor her. Ally smiled the entire time Austin performed. Ally let Austin have her stuffed dolphin, Dougie. When Dez and Austin told Ally and Nelson to get off the piano, Austin helped Ally off. Austin looked shocked and happy when Ally hugged him for the first time. After Ally does her red carpet walk, she looks at Austin, and when he tells her she should walk in from the side Auslly Hug<3entrance, she playfully hits him on the chest and rolls her eyes. Ally said she better keep holding on to Nelson, but when Austin walked in she said "Austin hey", and walked over to him leaving Nelson to fall. When Ally was talking a lot about preparing for the award show, she said "if we were going to match my dress with your tie..." which is something you usually say when you're going to prom. Austin brought a picture of Ally to the award show. Austin looked worried when Ally fell out of the garbage. Ally kept trying to apologize during Austin's performance. Austin accepted Ally's apology in the end and they all fist bumped. While Austin and Ally were writing the song, they kept smiling at each other. 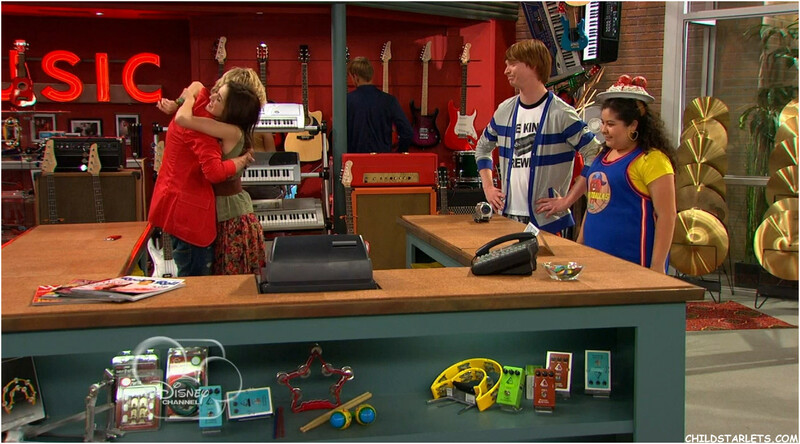 Ally tried to comfort Austin when he felt bad about Dez getting fired.Austin and Ally hug. Austin apologized to Ally when she got fired, but didn't do so to the others (if he did, it wasn't shown). When Austin was telling the gang he didn't want to be famous without his friends, he was looking mostly towards Ally. Austin had his hands up before Ally walked towards him for the hug. Ally kept her hands around Austin the whole time. They hugged for awhile, the longest they have hugged yet. When Trish says to Ally "They play a slow song, touch hands, stare into each others eyes and BOOM! instant boyfriend!" that is the exact same thing that happened to Austin and Ally (except the instant boyfriend part). Austin wanted Ally to see his dance moves. When Ally says "I must be the worst dancer in the history of dancing" Austin then says "Awww thats not true". Ally never brought up slow dancing, saying that "Trish thinks I can win Dallas over if I dance with him at her party, but I've only got one good move." Then Austin immediately offers to teach her how to slow dance. Ally wanted Austin to teach her how to slow dance.Austin teaches Ally how to dance. The way he said "sure" sounded like he really wanted to dance with her. Austin was holding Ally's hand tight when they were dancing. They both smiled at each other when they were dancing. Ally really cared when Austin hurt his ankle. Ally tells Austin she is really sorry about his ankle and that no one feels worse than she does. Austin smiles at Ally and says it's ok.
Austin smiles at Ally dancing when she was talking to Dallas. Austin goes to Ally right away when Dallas rejects her. Austin calls Ally and says he's been looking everywhere for her. Austin goes under the table to Ally. Austin tells Ally "Forget about him, he's not that great", to make her feel better. Austin tells Ally "That guy doesn't know what he's missing, you're awesome." Austin tells Dez to wait because he's talking to Ally. Austin asks Ally if she's going to be okay and she says "yeah". Instead of singing to impress the club owner, Austin prefers dancing with Ally. Austin tells Ally that it's more important that the coolest girl gets her dance. Ally says what Austin did for her was sweet. Austin says she can trust him. While Austin was dipping Ally, he gripped her tightly. When Austin was helping her up, he held her hand for a while. Austin looked a little mad/upset when Dez said Ally was invisible and got no credit. Austin defended Ally when Dez was making her feel unimportant as a shy songwriter: Austin: "Ally's not invisible, she just doesn't like the spotlight." Ally: "Yeah, because I have stage fright!" Austin said Ally's the best songwriter he knew. They sit really close together. Austin thinks Ally is a good singer. Austin stands there watching her, leaning against the door as if he's absorbed in watching her. Ally asks Austin if he saw her do her vocal warm-ups, hoping he didn't out of not wanting to be embarassed in front of him. Austin smiles at Ally's weird pose. Austin hopes that Ally isn't worried about not getting recognition. Ally tries to act cool in front of Austin. Austin says he can't do it without her and calls her awesome. Ally thanks him. Austin asks Dez if he was spying on them which he might think was their private moment. Austin tells Dez that Ally just wrote the best song for herself and that it's really good. Austin tried to get rid of Ally's stage fright. 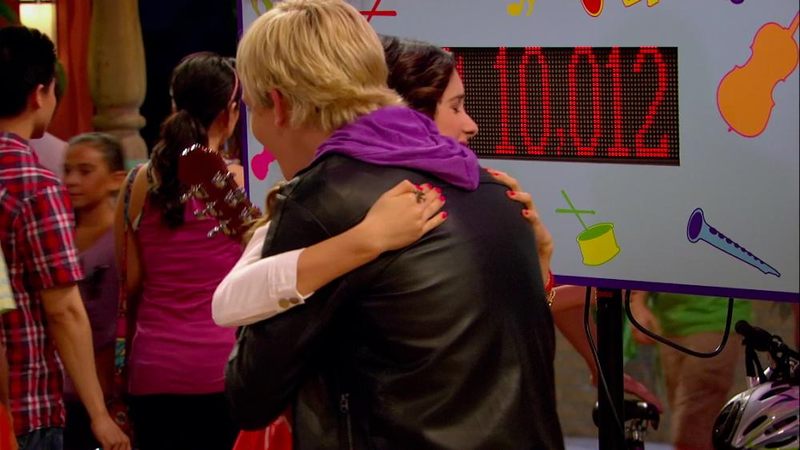 Austin helped get Ally's musical talent recognized by putting her on the radio.Austin and Ally hug. Austin plays Ally's song then smiles and looks at her and keeps smiling. Austin purposely brought the wrong CD. Ally was happy at first. Austin says immediately "That was my partner Ally Dawson! The most talented singer-songwriter I know!" while smiling. Austin said it was a great idea to give Ally props. Austin then says bad idea knowing Ally has stage fright. Austin looks at Ally nervously about it. Austin apologizes about Ally having to sing with him. Austin gets nervous when Ally doesn't realize that he meant to bring Ally's CD. Austin wants people to know how talented Ally is, and who she is. Austin tries his best to get rid of Ally's stage fright. Ally called Austin "a nice guy." and when she said that, Austin blushed. Austin knew more about Ally than Trish did, and Austin and Ally have known each other for far less time than Trish and Ally. Austin says to Ally, "It doesn't matter if the world doesn't know how talented you are, I always will." He put his head on Ally's shoulder when he tried to cure her stage fright but used the cure for hiccups. While Ally and Dallas were talking about how her job is the worst, Austin was in the back with Dez staring at them. Austin seemed to have a jealous expression on his face when Ally was saying "Staring at Dallas? What? No, that's ridiculous" after she stared at Dallas dreamily. Austin says I'll win the world record, probably trying to impress Ally. Austin knows that nothing funny happened between Ally and Dallas, meaning he knows Ally really well, because he couldn't have heard their conversation. When Ally needed help with the boxes, Austin immediately offered to help. When Dez said he can carry the box while spinning a basketball on his finger, Austin said he can carry two boxes, possibly trying to impress Ally. Austin apologized to Ally when he and Dez broke something. Austin said that spining the basketball was the easiest thing he's ever done, again trying to impress Ally. Austin agreed with Ally when she said his and Dez's competition was ruining their friendship. Austin acknowledged that Ally was right when she said that himself and Dez, are best friends, and shouldn't fight. Austin helps Ally with the song. Austin and Ally sat really close to each other on the piano bench. When Ally said she was missing her best friend, Austin looked at her with a hopeful look on his face. Austin tried to help Ally when she couldn't get her chair to open at the beach. Austin and Ally were the only ones who were at Sonic Boom working on the song. Austin seemed extremely happy when Ally thought of a good time at the beach. They used Ally's memory to write Austin's song. During Austin's performance at the beach, Ally was jumping along and watching him the whole time with a wide smile on her face. When Austin told Ally that the tweeter train left two years ago and left her there, Ally playfully rolled her eyes. Austin tried making Ally feel better when Ms. Suzy chose his song for the commercial. When Ally fell in the bowl of soup, Austin looked scared for her and tried to run towards her, but Trish was in the way. When Ally told Austin to go ahead and toot the horn (her hand) after announcing she had 5,000 followers on tweeters, Austin started smiling and tooted the horn. Austin was happy that she had a lot of followers. Austin was happy when Ally finally got her first gold star. When Austin showed Dez his frog his arm went behind Ally's and she was blushing lightly. Ally gets mad at Austin for missing their meeting,she thinks he doesn't respect her. When Ally left for the mall association meeting with Trish, Austin watched her leave. Austin felt bad about being late to the meetings Ally sets up and wants to make it up to her. Austin knows that Ally likes honesty. Ally thinks she was a little too hard on Austin. Austin's hands are on Ally's shoulders for a long time when he tells Ally he's not available at his house at the moment. Austin takes the guitar to get it signed by Bruno Mars for Ally because he knows how much she likes him. Ally doesn't want to sell Austin out to the mall association when she thinks he stole the guitar. When Ally shows the mall association the signed guitar, Pirate Frank says that shes only saying that because Austin's "matey" and she didn't say anything about it. Austin gives Ally a calendar book. Austin promises Ally that he'll always be there for her. He tells her to fill in the dates in the calendar. Austin says "No more Austin time, from now on It's Austin and Ally time. When Austin came back from the concert, he told Ally they could reherse all night. Ally couldn't believe it when she thought Austin stole the guitar. Ally said that Austin may be late alot but she knows he doesn't steal. Ally wanted to give Austin a chance to explain himself. Ausin seemed like he was really nervous when Ally was trying to confront him about the guitar, maybe because he doesn't want her to be mad at him for taking it without permission. Ally didn't want Austin to go to jail. 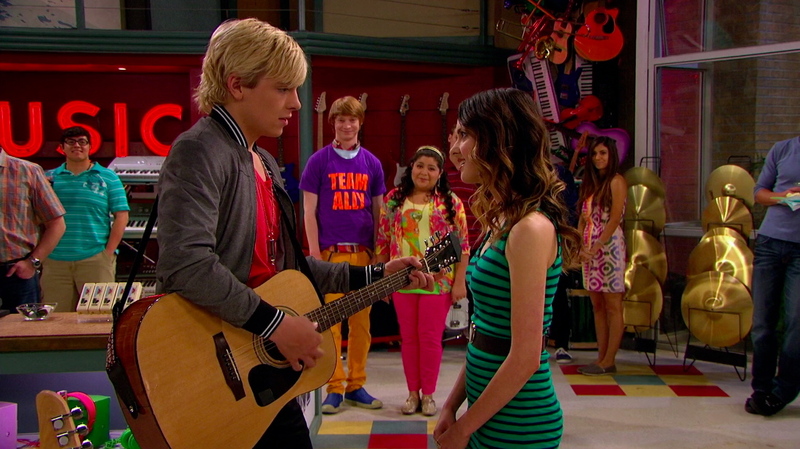 When Austin told Ally why he really took the guitar she said that him doing that was "incredible". Ally didn't like that the angry mob had pitchforks, probably because she doesn't want them to hurt Austin with them. Ally said that they needed to clear Austins name so nothing would happen to him. When Austin was late for catching the theif, Ally was really upset because he promised. Austin gets to the store super early because he promised Ally he wouldn't be late. When Dez made fun of her in the beginning of the episode, Austin was the only one who didn't laugh. Austin offers to stay in line to hold Ally's spot while she goes to watch the store. Austin and Ally both have each other's phone number. Austin taps Ally's nose and she smiles at him. Austin freaks out the most when Owen escapes. Austin shows his muscles off to Ally and winks at her when the show returns from commercial changes scenes. Austin says that if they ever made mistakes Ally would be super understanding. Austin tries to help Ally up when she falls into the popcorn but she helps herself up. Austin didn't want to disappoint Ally. When a teen tells Ally to get out of her way and get back, Austin looked worried. Ally knows that people like Austin. When the show changes scenes, Ally's holding a picture of Austin. Austin seemed awed at how well Ally could play the piano. When they were playing the piano Ally puts her head on Austin shoulder and Austin doesn't seem to mind.Who plays the piano better?? Austin seems disappointed that Ally can't be in Dez's movie with him. Ally gets affended when Austin says prop girl is perfect for Ally, because she doesn't have a social life. Ally tries to act like Austin's fear isn't silly. Austin only told Ally his biggest fear, not even telling Dez, although Dez already figured it out. Ally only told Austin about the cause of her stage fright. To make sure he didn't feel bad Ally told Austin that she was afraid of umbrellas too but he figured out that she was lying. Austin thanks Ally for helping him realize how silly his fear was. Ally tried to help Austin get rid of his fear. Ally puts her hand on Austin's arm and doesn't pull away; when she's pushing him towards the patio umbrella in the mall. Ally gets two of Austin's favorite things, cheerleaders and pancakes, to get rid of his fear of umbrellas. Ally looked worried when Austin's pants ripped off and started covering her eyes, showing that she doesn't want to see Austin embarrassed like that. Ally covers for Austin, when Dez asks them about Austin's secret. When Dez brings out the umbrella hat, Ally cuts in front of Austin to comfort him. Ally tells Austin how she got her fear of stage fright. Austin rests his arm on Ally's shoulder when he sees about 20 more umbrellas on the set. Ally smiles at Austin when he says, "I'm not scared of you Claws; I'm not scared of anything." Austin gets annoyed when Dez says that he only wears boxers with trucks on them, not wanting Ally to hear. Ally says that they should eat first before Austin asks Cassidy out in a rather stall-ish way. Ally was fixing Austin's hair and if there was anything on his shirt when he was going to talk to Cassidy, and she even calls him 'tiger'. When Austin was talking to Cassidy, he listed off their similarities (both in love with music, both in high school) and it was the exact same similarities between him and Ally. Ally also wants to know why Cassidy said no to Austin; which proves she cares about him. Ally suggests dessert, to help Austin feel better, when Cassidy rejects going out with him. Austin jumps over Ally, who ducks in time. Ally spys on Austin and Cassidy. Austin pulls a menu out of a person's hands, thinking it was Ally. It shows that he knows that Ally would spy on them. Ally seems really sad when she couldn't write a good song for Austin. Ally looked really hurt when Austin blamed her for making Cassidy not want to go out with him. After Austin blamed Ally, he tried to apologize, but she had already left the restaurant. When Austin came to apologize, she seemed eager to hear what he had to say. Austin apologized to Ally, after blaming her for the whole fiasco, and being a jerk. Austin liked it when Ally danced all goofy and suggests they 'dance it out'. So they both goofily dance together. Austin watches Ally eat, even though she looks disgusting doing it. Austin and Ally where jumping up and down, and looking at each other when saying yeah! yeah! yeah! Ally put the calculator away when Austin told her to. Austin and Ally had to not be disturbed, just like a couple on a date. Austin tried to calm Ally down when she saw the spider. When Ally said "It's time to get this party started" Austin was happy that Ally is having fun, copying her phrase. Austin high-fived only Ally when he came out to perform. Austin looked at Ally and sang the lyrics, "It's all I ever wanted"
Austin put his arm on Ally's shoulder and she didn't seem to mind at all, even though she knew she was on live TV. When Austin was presenting the song, he said he loves to spend his summer with his friends and he moved very close to Ally. Ally pushes Austin to do his best to make sure the demo is perfect. Ally (and Dez) give Austin presents. Ally tries really hard to cheer Austin up. Austin looks embarrassed, when his parents make him be "prince Austin" in front of her. Ally gave Austin a scarf with all of their names on it. (Austin, Ally, Dez and Trish) and Austin and Ally's names were right next to each other's. Ally went to lunch with Austin and his parents. They hugged in the food court, while they hugged Austin smiled. Austin pulled Ally slightly closer to him when they hugged the first time. Austin told Ally he couldn't imagine not being able to sing her songs. Ally said she couldn't wait for Austin to come back when the procedure is done. They hugged again in the practice room when Austin came back. Ally was the first one to hug Austin when he came back. Ally gives Austin soup to make him feel better. Ally was worried about Austin. 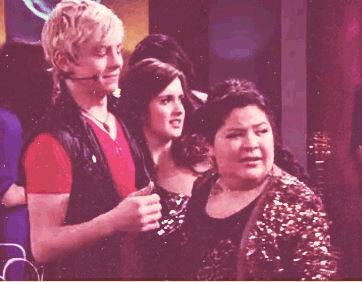 Austin gave Ally a look when she kept talking. Austin was more impressed with the card that had Ally's face in it as well as Dez's than the one with just Dez's face. Austin wanted to help Ally get into the music school. After Austin sang the rest of Ally's goodbye song, he did not talk until she went to him and asked how he felt, which shows that he probably was too shocked and sad to speak. Austin was sad when Ally wanted to go to the school. Austin said Ally definitely deserves half. Austin tells the people in the party that tonight was supposed to be about him, but its also a going away party for Ally. Austin performed Can't Do It Without You (Acoustic Version) for Ally. The goodbye video mainly had moments between Austin and Ally. When Ally said that she will stay, Austin was happy. Austin, Ally, and Trish stopped hugging and Austin still had his arm around Ally, until Dez came back. When Austin sings Illusion he is mainly singing in Ally's direction and he mentions " I promise I won't disappear, I'll be right here" and then appears near her at the end of the song, implying she's the girl he's singing about. When Austin finished singing the song of Illusion, he was very close to Ally and put his arm on her shoulder. 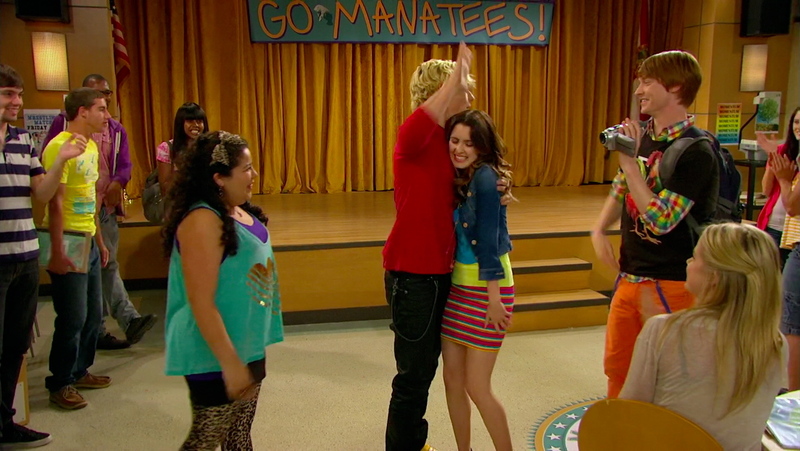 When they did the first group hug, Dez went to the other group, but Austin kept his arm around Ally. He apologized for scaring Ally in the practice room. Ally said they went to the water park together, and said he helped her when she was scared of the big slide. Austin said "That's not nice" when Dez said to Ally she will never be like Galexis Nova: confident and fearless. 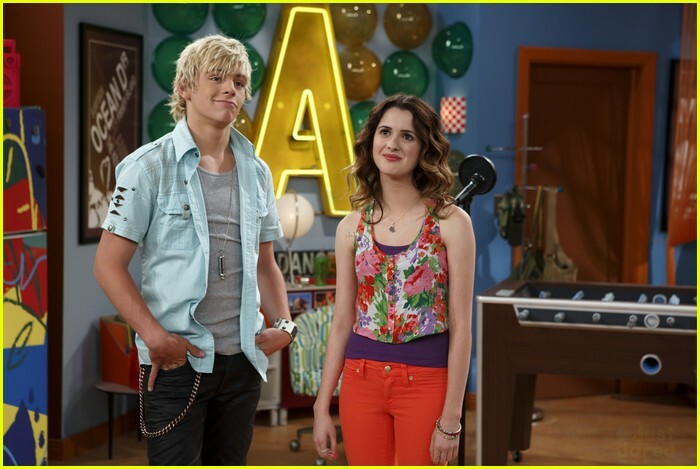 Austin and Ally singing "Don't look down"Austin seemed jealous when Ally said she was meeting someone for lunch. Austin felt really bad about calling Ally an "evil gutless rat". When Ally and Trish came to the party, Austin looked them up and down and said they looked amazing. When Ally went on stage to perform, Austin smiled. Austin was happy that Ally will perform with him. They were flirtatiously looking at each other and smiling during the entire duet. They hugged at the end of their duet. At the end, Austin was really thrilled about Ally performing with him, and says he hopes she'll be able to sing with him again. Austin said to Ally that she rocked on stage. Both of them pictured if they were dating, and they both had a smile on their faces. They looked at each other and nervously said "Weird.." before leaving rather quickly. When Trent challenged Austin to a dance-off, Ally gave him a knowing look and told him he didn't have to prove anything to Trent. Austin hugs Ally*Austin agreed with Ally and hopped off stage. Ally was cheering Austin on when he was dancing. When Austin got off the stage, he put his arm around Ally and hugged her. When Austin figured out that Trish was really dating somebody, Austin grabbed Ally's shoulders real tight, and when Ally figured it out, she grabbed Austin too. *When Ally said that she just realized why they called Minis by its name, Austin shook his head and smiled like he thought she was silly. When Ally realized that Austin still hadn't ate his mini hot dog, she tried to grab it from him but he hurried up and ate it. Ally was smiling when Austin was showing Team Austin his new dance moves at the beginning of the episode. After the theme song was over, Austin and Ally were walking to together like they were dating when they were walking to Trish and Dez when they were laughing. Austin and Ally sat next to each other at the audition. When Ally stood up and said "I like him, lets hire him!" the second time, Austin grabbed her shoulder and sat her down and said with a smile, "I think we should see him dance first. Austin thought that it was crazy that Ally thought Trish and Dez were dating, until he seen them hugging in the hall. Austin and Ally went to Minis together. Austin tried to cheer Ally up when she said that she didn't understand why Trish didn't tell her by saying that Trish probably felt weird about it. Before Austin started his rehearsal with his new back-up dancers at the Sonic Boom, you can see him looking at Ally as if he was trying to see if she was watching. When Ally said "Look at them their so in love" Austin raised his eyebrows when she said "Love" possibly thinking about Ally when she said that. When Trent said that Austin was just scared to do the dance off with him, Ally started to look mad. When Austin was doing the Dance off with Trent she was cheering on Austin and she looked like she thought his dancing was hot. When Ally pulled out the mini cake, she looked at Austin and smiled. Austin calls Ally a wise women. Ally was impressed when Austin did kung fu on the wood. Austin says that Ally is more important to him than getting on the cover of the magazine (Cheetah Beat). Austin said she didn't have to go through this trouble of bungee jumping. Ally turned down Austin's offers to call off the bungee jumping. Austin says he'd rather lose the magazine cover than to see Ally so scared. Austin was the one who wanted to hold hands when they jumped "Hold my hand, we'll jump together". They hold hands when they jump off the bridge. When Ally said she needed to think about it for a while before they bungee jumped, Austin tells her to take all the time she needs. Ally said that Austin is sweet. When Megan told Trish, Austin and Dez to describe Ally in 1 word, Austin said 'talented'. Austin really wanted to help Ally so she wouldn't get in trouble. Austin sneaked out to help Ally. After Austin said to Ally that he can perform at her fundraiser, he said "You know i'd always help you," in a meaningful voice. Austin risked getting caught by his parents, just to help Ally. Austin said to Ally "I couldn't let you down," to which Ally replied by saying "Aww." They were sitting very closely next to each other. Austin and Ally hug each other twice. 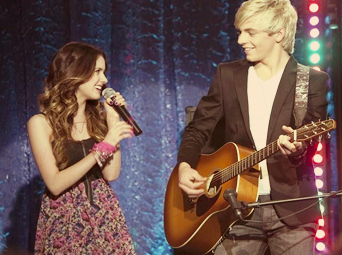 When Austin is singing, Ally is watching him with a big smile. When Austin sings: "Girl you got it 2." He looks and points at Ally. After Austin finishes singing he says, "Wow, another great song Ally" and then he says that she is the best song writer in the business. When Trent asks Ally to write him a song Austin looks jealous and tells him: "Buh Bye!" Austin says that when he stole her song it was an accident and he looks offended. Ally said that she was glad that she forgave Austin because look how awesome it turned out. Austin says that Ally can always trust him. After Ally says: "Can I Austin?! Can I?" Austin looks kind of taken aback but he gives a small nod. And then Ally puts her hands up in a kind of "sorry" gesture. At the end when Ally put the 'Kick me' signs on their backs, Austin's sign was a pink color while the others were yellow. Ally moves to sit next to Austin on the plane. On the plane to New York, Austin discusses finally achieving his dream with Ally and confesses that he's a bit nervous when she says there will be billions of people watching him. When Austin was telling Ally that he has been watching Times Sqare on new years eve since he was a kid and said 'I wanna make all those people feel the same way about me' he looked at her dreamly and she replyed 'you will' and looked back at him in a dreamy way. Austin asks Ally "Is this really happening?" when his dream is about come true, Ally assures him that everything is real. Ally told the kid to zip it when he thought Austin was a poser. Austin and Ally sit close together on the helicopter. Ally tears up at Austin's performance. After Austin's performance, Ally was the first one to rush to Austin and hug him followed by the others. When Team Austin hugged after Austin's performance, Austin kept one arm around Ally and the other arm to hug Trish and Dez. Austin says that the best part is living my dream with my friends, and he was looking directly at Ally. When Trish was counting the money Emma gave her, Austin and Ally were looking over the city together. Ally keeps staring at Austin since her eyes froze open from tearing up during his performance. When Emma called dibs on Austin's toe, she glared at Ally as if she knew there was something going on between them. Austin and Ally sat right next to each other when Emma was explaining the ratio to them, even though there was much more space on the couch. When Jessie said she was a good song writer Ally said that she and Austin write all their songs, Austin was nodding and smiling when Ally stood up and started talking. They hug (group hug) twice. When everyone was in the cab, heading towards Times Square, Austin and Ally were sitting next to each other. Austin said it was a good idea that Dez made her the wardrobe girl, even though his clothes were on weirdly. When Ally was stuck in the plastic ball, her hand was on the ball and on the outside, Austin's hand was on the exact same place as her hand. Basically, their palms were touching through the plastic ball. When Austin saw Ally in the hamster ball with Kira, he said. "Hold on Ally!" really worriedly. Ally says that Austin is funny, talented, an awesome dancer, can count to ten in Spanish, and has amazing hair, as if she had a crush on him. Kira thinks that they like each other. Trish says that Austin and Ally have a special relationship. Dez says in an aww voice "Austin's Ally's secret admirer?" Austin sends the flowers with the message "There's no way I could make it without you." They go on a practice date together. Austin puts his arm around Ally. When Ally says "She'll nestle up, feeling butterflies" and Austin says "My heart will be beating out of my chest" it looks like what they're saying is really happening. They both say 'It'll be... perfect' then look at each other dreamily. They cuddle for a really long time, and only stop when Dez comes in. Trish calls Austin the boy of Ally's dreams. Trish told Austin that sometimes the perfect girl is closer than you think, reffering to Ally. Ally punches Austin's shoulder in a playful way and says "pal" rather unconvincingly and awkwardly. When Austin was leaving, Ally was fake laughing, the same laugh she had when she liked Dallas. When Ally said Austin has amazing hair, she actually stroked his hair. Ally tried to save Austin and Kira's date, even though she likes him. When Elliot comes to Sonic Boom, Austin says, "that's Ally's friend," as if he's jealous. Austin got overly defensive when Trish suggested he might be jealous of Ally and Elliot. Austin gets jealous of Ally's friendship with Elliot. Ally stops Austin by putting her hand on his stomach. When Ally and Elliot are talking about how much fun they had, Austin says, "Well, I bet your fun back then wasn't any more fun than our fun back now"
Austin realizes he does like Ally. Austin admits to Dez that he likes Ally. Austin said, "I like writing songs with her. I like how I can talk to her about anything...and I like her smile, and the way she laughs." Austin and Ally almost kiss. When Austin heard that Ally and Elliot were basket weaving, he attempted to weave his own basket. Austin says he gets an 'awesome feeling' when he and Ally accidentally touch hands at the piano. A feeling he doesn't get with anyone including Kira. Austin likes when his and Ally's hand touches when they're playing piano. As Ally plays the piano, Austin doesn't take his eyes off her. In the last Auslly scene, Austin is wearing blue and Ally is wearing Red. Just like in Club Owners & Quinceaneras, when they were dancing. Elliot and Austin had a battle, because Austin wanted to impress Ally. When Elliot says that he and Ally are the best team, Austin denied with jealous look. 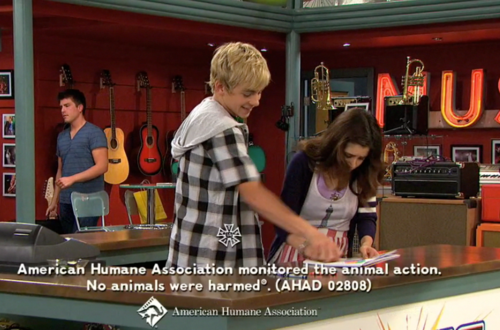 When Elliot said that he's not into music, Austin said to Ally "Ha! You hear that Ally? He's not into music" to impress her. When Dez says to Austin that Ally wants to be Elliot's girlfriend, Austin screemed "WHAT?!" and looked alarmed. Austin says that Ally can't be with Elliot and that he's not right guy for her. Austin ran out of the practice room when he thought that Ally wanted to be Elliot's girlfriend. After Austin won the competition with Elliot he says "He's not so perfect now is he, Ally? Still want to be his girlfriend?" to Ally. Austin says that he and Ally should be together. Austin didn't want to allow Ally to be Elliot's girlfriend. When Ally was showing the chords she wants for the song they were gazing into each others eyes. They are practicing a new song. When Ally says the next line of the song is ("If you want a friend") Austin sounded nervous saying "Right, friend." They both tried to listen what each other was talking about. When Austin and Ally are talking at the piano, if you replace when they say "song" with another word (E.G: relationship) you can tell they are talking about themselves. It's revealed in this episode that Ally talked to her mom about Austin a lot. Austin and Ally perform together. Austin and Ally hug 4 times. The first time they hugged in this episode, they were super close and kept swaying back and forth and awkwardly pulled away. Penny asked Ally if anything was going on between her and Austin. Ally looked really hurt when Kira came and told Austin she would be his girlfriend and hugged him. Austin also felt really bad when Kira came and hugged him and hurt Ally. When they turned to each other during the performance, it looks as if they were about to kiss on stage when the song was over.The Auslly Kiss! Austin and Ally held hands while leaving the practice room. When Kira hugged Austin, Austin didn't hug back. Austin looked disappointed that Kira would be his girlfriend. Austin was disappointed because he deeply cares about Ally. Austin pets Ally while talking about how far she's come along, and for a second, Ally smiles at it. After Ally thanks Austin, she pets him and they both laugh. Ally looked really hurt when she overheard Austin telling Dez he wanted to be with Kira. When Ally was singing the line of the song "You can come to me", she smiled at Austin. They got lost in each others' eyes during the performance and realized they were still on stage so they looked away. Austin told Ally he was proud of her. Dez was wearing a 'Team Ally' T-shirt. After Austin said he was choosing Kira, Dez said, "I was really hoping you'd choose Ally. I think you're right for each other." Trish and Dez really wanted Austin and Ally to be together. When Ally's dad asked Austin to sing he said "not without Ally". When Ally spoke to Trish about Austin choosing Kira Ally admitted she was upset showing she really wanted Austin to be her boyfriend. At the end of the episode when Kira agreed to be Austin's girlfriend, Ally looked and was heartbroken. When Austin and Ally talked about the line "If you want a friend", Ally asked if they should change it into a stronger word (more than friends). At the begnning of the episode, when Austin let go of Kira and walked up to Ally, Ally looked like she was trying to hold back her tears. Ally admits Austin was her first kiss. Ally said "Lets just stick to being friends and partners and pretend the kiss never happened", then Austin said "I can't pretend it never happened. Ally i wanna be with you". Austin was upset when Ally didn't want to write a song later. He then wished she wasn't so over him. Austin wanted to give Ally a gift. Austin got Ally a piano, and wanted to make it special, by dropping it down on a parachute. After the piano falls, Austin looks down at the mess and says "Ally I'm really sorry" and then walks away with his head hung down. Austin says that he and Ally are an official couple. Austin sang the song that Ally wrote about him. Austin got happy when he figured out that Ally liked him for a long time. 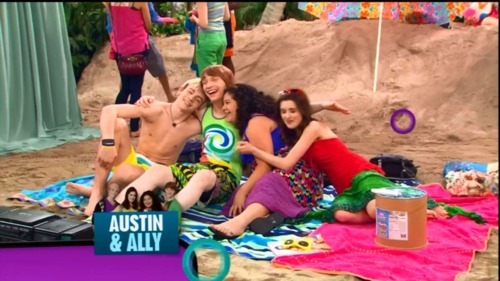 Austin pulls Ally close and puts his arm around her. Austin was happy when Ally kept the note he gave her in Girlfriends & Girl Friends. Austin and Ally finally start dating in this episode. Ally said their kiss was good. Austin said it wasreally good. And Dez said it was even magical. Austin tries to break up with Kira to be with Ally. Austin seemed to have his mind on Ally a lot in this episode. After Austin left the party when the piano fell, Dez found him in the practice room at the piano with his head hanging down,probably thinking about have awful he felt. Austin said that Ally's song about him was "Amazing". Austin thought Ally hated him for what he did. Austin said he will never forget the first time he and Ally wrote there first song together, meaning that is a special memory to him. Ally's song about Austin probably reminded him about his feelings for her, and thats why he knew to sing it to her. Ally looked like she couldn't believe what Austin was doing when he was singing to her, she was staring at Austin the whole time, smiling. In the lines, "how long till I stop pretending", it might refer to how Austin and Ally kept their feelings inside for the longest time and pretended like nothing was going on inside. Trish and Dez, along with Ally's parents, were awed by the scene in front of them, while Austin was singing to Ally. Trish and Dez mainly, were so happy, because they always wanted them to be together. Everyone in the Sonic Boom seemed "awed" at the fact that Austin was singing to Ally. Megan said she was 'Fa-reaking', about what Austin just did for Ally. Austin and Ally posed for Megan while they were hugging to get there pictures taken, with no regret that everyone was going to know they were a couple. They held each other until the scene changed. When Trish walked in the Sonic Boom with the magazine, Austin and Ally were already there alone spending time together. Austin and Ally were happy they were on the cover of Cheetah Beat. After Austin seranaded Ally, she was speechless. When Ally said 'Austin I wanna...' it looked like Austin was looking at her lips. *Ally said that she really wishes Austin could be there for her speech. Austin asks Ally if she wants to go get something to eat after he finishes his car practicing. 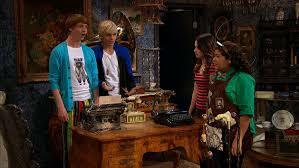 Ally complains about all the customers, so Austin tries to help using the magic typewriter. Ally was disappointed when Austin couldn't show up at her dad's award ceremony. When Chuck made Ally fall in love with him by the typewriter, Austin looked like he was jealous. Note: There weren't a lot of Auslly moments since this episode is not in chronological order and is totally fiction. Austin was helping Ally to play Clarinet Golf and was behind her, touching her hands and they were cuddling. Ally said Austin's full name. Ally said she will never tell Austin her middle name and looked at him in a flirty way. Austin breaks the awkward silence by saying "Our first official date". It's awkward at their date and Austin sees another couple feeding each other so he tries to feed Ally but accidentally smeared it all over her face when his chair gets levitated and said sorry 3 times. When Austin was talking to Dez, he called Ally his girlfriend. They break up, but agree that they will get back together when they're both ready. They both really want to make the relationship work. After Ally said she really wanted the relationship to work Austin even went far enough to say that he wanted it to work more than anything,possibly meaning he might love Ally. They booped each others' noses while saying a cute nickname and said sorry afterwards. Ally told Austin to not let go, while he was still hugging her and she gripped on tighter. Austin said he wasn't going to. Ally asked Austin if the hug was just as friends. Ally accidentally smacks Austin's head while trying to high five. They were both too focused on trying to compromise with each other, they didn't listen to the song until later on. Austin said it's okay if Ally thinks he's childish, since he knows it. Ally said she doesn't think Austin's childish. Austin doesn't think Ally is weak. They both kept shaking Bitey. Ally looked upset when Austin said "Maybe Butch and Bitey should just go back to being friends". There was a reference to Rockers & Writers when they tried to hug/handshake. They were both afraid to hurt each others' feelings. Austin called Ally "My little goose-pickle" because he knows Ally loves Pickles the Goose and pickles. Austin said he's just trying to be a gentleman. Ally said she can order for herself but appreciates what Austin was trying to do. There is also a reference to Zaliens & Cloud Watchers because both episodes show how opposites they are. Trish said Austin and Ally perfect for each other while talking to Ally about her relationship with Austin. Ally said she was always afraid something like this would happen if her and Austin started dating. Austin said they'll be friends and partners, always. Ally told Austin not to let go when they hugged to stay friends for that time and Austin said that he was not going to. They both smiled while they hugged each other. Even though they break up they agree to get back together when they're both ready to be a couple again which is most likely to be in Season 3. Dez started to cry when Austin and Ally said they have gone back to being friends, showing he really wanted them to stay a couple. Dez said he'll never get over Austin and Ally going back to being friends. Austin felt bad that he lost Ally's grandma's necklace. Dez found Ally's necklace but Austin took it from him and put it around her neck. Austin was the only one willing to help Ally pick up her necklace for her photo-shoot of magazine cover. Austin (and Trish) helped Ally with poses to do at the magazine shoot. Austin didn't like the combination pose Ally did. Austin likes Ally's grandmother who the makes cookies instead of the one who's boring and smells like cabbage. Austin was upset that Ally lied about her grandmother making cookies, and instead, smelled like cabbage. Austin still thought Ally was pretty even though she looked terrible. Ally smiled at Austin when he showed her how to pose. *Austin helps Ally in her audition. Austin winked his eyebrow when he looked at Ally. Austin felt sorry that Ally was not signed to Starr Records . Austin felt proud that Ally is already standing in her own. Austin put both his hands on Ally's shoulders. Ally told Austin he owes her $300. Ally says it's not a good idea for her and Austin to compete for Jimmy's attention, probably because she cares about Austin and doesn't want to start a rivalry. There were Austin and Ally cardboard cut-outs. In the cardboard cut-outs, Austin had his arm around Ally and Ally had her arm around his waist.. Ally told Austin she's leaving the "Stray Kitties". Austin was acting like a supportive boyfriend, even though they weren't dating at the time. Austin and Ally were walking alone together when they got to the Sonic Boom for the first Team Austin and Team Ally meeting. Austin was smiling at Ally in a loving way during her performance. Austin said "Your lips are all...dark" meaning he was looking at her lips. Austin wiped feathers that Val threw in the air off of Ally's hair. 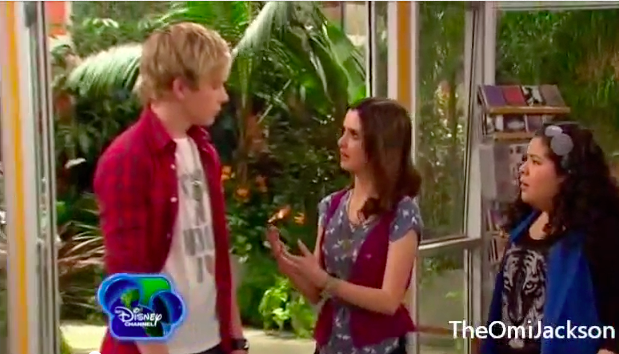 Austin asks Ally if she wants to go to the zoo to laugh at the monkeys. Austin said he's been learning from the best song writer in the business, reffering to Ally. *Austin and Ally have a "bear hug". Ally says "I can't imagine writing songs without you" to Austin. Austin says "I'm always going to need you, Ally"
Austin didn't think Ally's "Bear jokes" were funny. They hug each other by the waist. Ally lied about Austin's song being good because she didn't want to hurt his feelings. Ally tells Trish she can't make fun of Austin's song. Ally tells Austin that his song is awful and is just terrible, but said it with a smile on her face to not make Austin feel as bad. Austin wanted to prove to Ally that he can write his own songs, possibly to impress her. Ally feels bad that she didn't have enough time to write Austin's songs. Ally insisted Austin should sing one of her songs. Austin tells Ally her songs are too girly. Ally let Austin see her book. When Ally said she sharpened the pencils, Austin smiled at her. Ally said she's not his songwriter for his "Pioneer Rangers" song. Ally was disgusted when Austin put salami and mustard on his cereal. Austin and Ally both said Nelson's name at the same time. Ally sang along to Austin's song. They both went to help Nelson when he got crushed by the tent. Ally's been lying a lot, which means Austin is probably rubbing off on her. This is one of the many times that they hugged each other. They played table soccer together. They both felt Dez's fur. Austin was excited when he heard that Jimmy asked to talk to Ally. Austin along with (Trish & Dez) were preparing a Congratulations on your Record Deal party for Ally. Austin made a singing card for Ally. When Austin heard that Ally didn't receive a record deal, he (and Trish & Dez) quickly tried to cover up the Congratulations on your Record Deal party that they were preparing for Ally. Austin felt bad that Ally didn't get a record deal. When Ally opened the card Austin quickly took it and crumpled, because he didn't want Ally to get depressed more. Austin tells Ally that she shouldn't be too sad. Austin reminds Ally that other labels wanted her. Austin was contented when Ally said that she doesn't sell Kira her song. Austin said that Ally is the only person twho should sing her song. When Jimmy Starr found out they accidentally recorded over Kira's song and got mad, he started to get mad at Austin and Ally. However, Austin stood up for Ally and told Jimmy not to blame her. Ally felt bad when Austin was fired from Starr Records. Ally wanted to give her song to Kira, because she wanted Austin to come back to Starr Records. Austin tried to stop Ally from giving her song to Kira. Austin grabs Ally's shoulders and tells her she can't give her song to Kira, but it was too late. Austin was upset when Kira had to sing Ally's song. When Kira was about to perform, Austin looked at Ally sadly. Austin was happy when Kira wanted Ally to sing the song. Austin pushed Ally to enter the stage. Austin was clapping when Ally performed. Ally was happy when Jimmy decided to hired Austin back. Austin didn't want Jimmy to hired him again, because he knew that Jimmy can't sign Ally too. Austin wanted Jimmy to sign Ally instead of him. Ally told Austin that he didn't have to do that for her. When Jimmy offered to sign Ally to his record label, Austin was very happy. The other Auslly moments will be edited.